This quilt isn't the oldest UFO in the bin, but pretty close! It was a row quilt from several (maybe 10?) years ago. When my long-time friend wanted a quilt for her niece, I invited her to look through the "pile." She picked this one, so I had to put the borders on it and get it quilted. The fabrics are all batiks. Some of the blocks were paper pieced -- and look, there is an entire row of flying geese! Cornelia did a lovely job on the quilting. This quilt is featured in my soon-to-be released YouTube video about Susie's Magic binding. Here is Leah holding her quilt. Isn't she pretty? And her Mama raised her right -- she acted excited about the quilt, and gave me a thank-you hug! I dropped the ball on counting quilts this year -- I have no idea what number this one would be! Love the quilt and the comment about her mama teaching her right. I just need a big like button today! She chose a beauty. I love it! She made a great choice, I like this one. Lovely and colourful! Wow what a great quilt. Congratulations and I'm glad to hear you got a hug too! This quilt is absolutely lovely! I'm not a huge fan of batiks, but I love them in this beautiful quilt. Lucky Leah! Marti this is one of my all time favourites of yours. What a fine job you did. I know Leah's pleasure was genuine, look at that big smile! 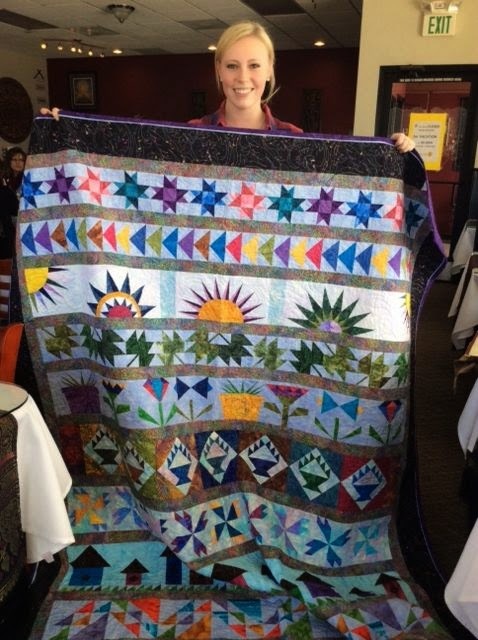 I hope Leah was excited about receiving the quilt. It's gorgeous! 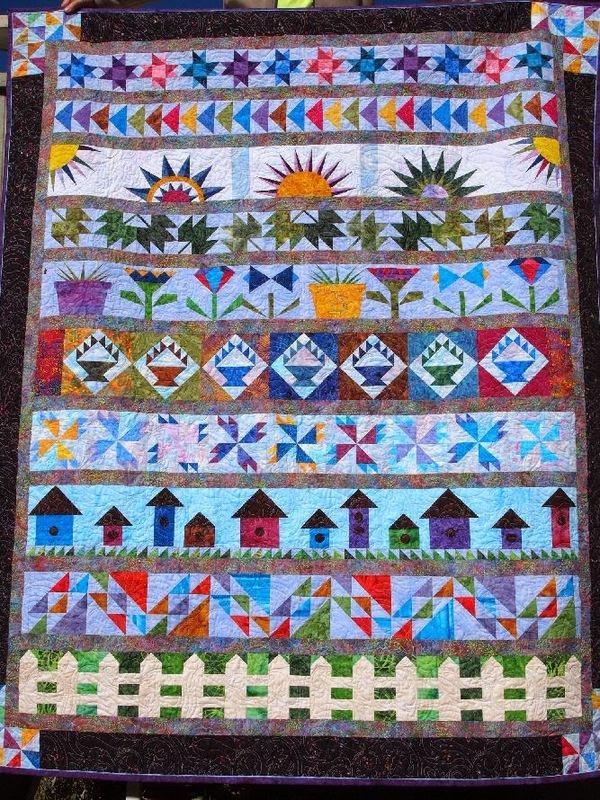 I absolutely love this happy quilt, it's so full of color...! It looks great - and one less in the "to do" pile...10 years is not so old . . . I love this! Love the New York Beauty-type sunburst row.